Cut to 15 years later, Joe’s son, Ford (Aaron Taylor-Johnson) is now grown up and has a family of his own. He has just got back from a stint as a bomb disposal expert (this will definitely NOT be significant later) when he gets a phone call that his Dad has been arrested. His Dad convinces him to investigate the site of the explosion and they soon discover something sure to send tremors around the world…. So yeah, that’s the good bit of the film described. The rest of the film sees monsters taking centre stage at the expense of literally anything interesting happening to the human characters. 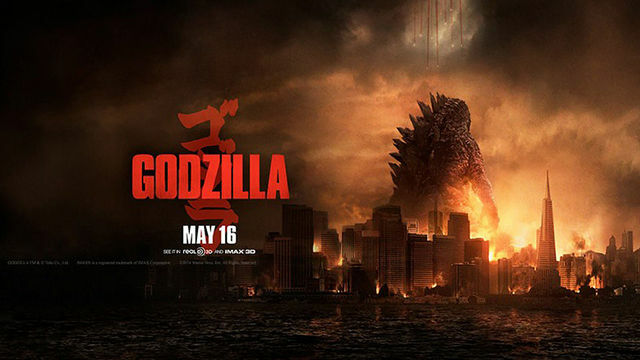 Don’t get me wrong, Godzilla looks amazing and acts in exactly the way we want Godzilla to act. Characters aren’t quite sure whether he is a god, something to be worshipped, or a monster, something to be feared, and the film does a good job of seeing him in those terms. There are also parallels with nuclear energy the film does a good job of drawing. The problem is that I can describe to you what happens in the second and third act of the movie in just a couple of sentences. All the interesting character development that the film does a reasonable job of establishing early on goes to complete waste because they are given little to do beyond either run or fight. This left the paradoxical situation where we have huge beasts fighting, massive explosions, and buildings being knocked to the ground but it was all incredibly dull. This entry was posted in Gareth Edwards, Godzilla, movie, watching. Bookmark the permalink. You can observe a lot just by watching Godzilla.